I was provided a free Circle with Disney to facilitate this review. All opinions are 100% my own. Computers. Tablets. E-readers. Smart TVs. The list goes on and on with devices that are becoming so commonplace in households. It’s great – goodness knows we love technology in our home – but it also comes with a risk. The internet can be such a great tool and resource, but it also holds many dangers, especially for kids who may not know better. 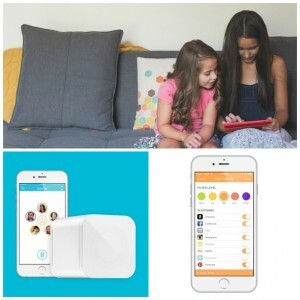 Keep your family safe and Take Control of Your Internet using Circle with Disney! You can track their online actions, put certain blocks in affect, and even pause internet to a specific device with the push of a button. I’ll be honest – I don’t understand all the ‘technical’ behind Circle with Disney. That’s hubby’s department, and I’m sure he’ll do a post on his side over at The Nerd Dad soon enough. This is just my own observations and understandings of how it works. Perhaps it’s the ‘dumbed down’ version? Anywho – I love it, that’s what matters! Circle with Disney is a little square box device (I would think it’d be circle because the name, but just bare with me here) that can connect wirelessly to your home internet. We leave ours wired since we use a lot of bandwidth, and don’t want it slowing it down. Unless you use lots like us, though, wireless is just great! It has about an 8 hour battery life, but we keep ours plugged in most of the time. You set it up using the Circle app so every device is on it – computers, tablets, even phones. You can then set up unique profiles as you see fit. Hubby and I have our own, our Black Widow has her own since she’s a little older – and has her own Kindle – then the boys have a profile together. While we don’t let our kids on the tablets every day, Black Widow does have some math games and such on her Kindle. We can set time limits to how much of this she can do, or set limits on how much MineCraft/etc. It’s also really nice with the boys, so we don’t have to watch the clock. Select from category, app or platform to set the time you want them limited to. You can even do a ‘total time limit’ for the day! This is very nice, since bedtime is already a struggle! When it’s time for the kids to get ready for bed, even the devices go ‘to bed’ for the night and internet is paused to them for the night. The kids will argue less if they see the tablet won’t even work, so may as well go to sleep for tomorrow! Don’t worry, you also put in a ‘wake up’ time when the internet will resume. I touched on this above, such as Black Widow being allowed a little more search freedom for homework purposes. Circle with Disney has a few pre-set ones: Pre-K, Kid, Teen and Adult – but you can go in and customize as you like. I don’t have to worry about inappropriate content popping up, or something accidentally searching for sites I don’t want in my home. At first I wasn’t sure if I cared about the insights feature, but now I absolutely love it! You can go into each person’s profile and see their insights – letting you know exactly what sites were visited, what apps were used, etc. and how long was spent on them. And guess what? Anything that touches the internet goes through Circle, so even Incognito searches show up. LOVE IT! Kids not listening? Did they loose some privileges with their screen time? Just go into your Circle app, click on their profile/device and hit the handy PAUSE BUTTON. Internet now is turned off for that person/device until you turn it back on. Handy, right? I have yet to use this – but I’m sure it’ll be great as they get older. So why ‘Circle with Disney‘? Glad you asked! So nab yours today, and take control of your internet using Circle with Disney!